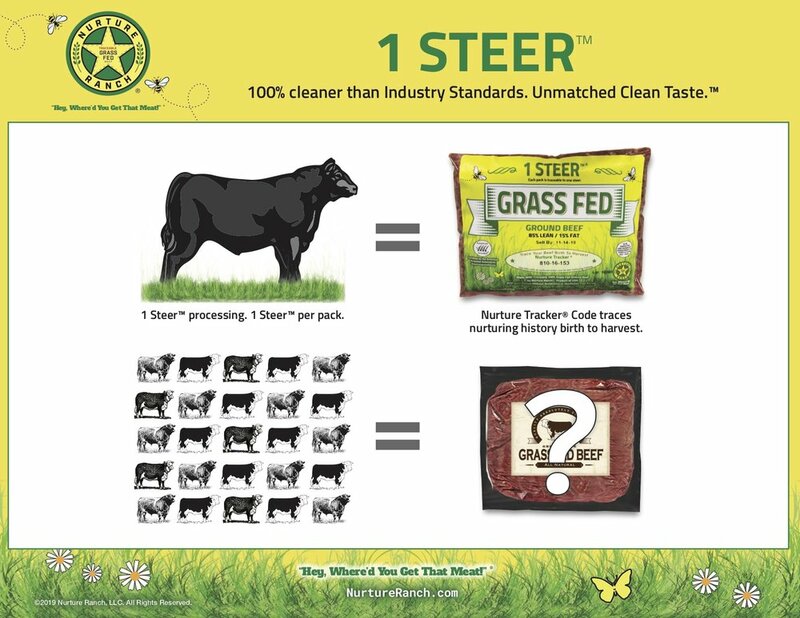 1 Steer™ and 1 Cow™ at a time processing delivers a clean taste with lower potential of bacteria than industry standards. Almost all meat in the US, with very few exceptions, is processed by mixing meat sources together. Independent lab tests identify that Nurture Ranch 1 Steer™ has significantly lower potential to form bacteria than industry average standards. Because our beef is grown domestically, it also eliminates potential for foreign country bacteria. The majority of grass fed beef in the United States is imported, mass processed twice, once in another country and again in the USA, and labeled "Product Of USA" after it passes through a USDA inspected facility. Mixing meat sources elevates potential for bacteria and when you mix parts from different parts of the world it increases potential of foreign bacteria strains not indigenous to the USA. We package in our Bloom Fresh™ package that is air tight and vacuum sealed twice to make your meat fresher. See all of 1 Steer™ and 1 Cow™ products here. 1 Steer™ is made from a single male bovine. 1 Cow™ is made from a single female bovine.